Get your little (and big) Monster Jam fans ready because Monster Jam is revving into the Wells Fargo Center in Philadelphia from Friday October 2nd through Sunday, October 4th! Save $5 off $30 and $20 seats with promo code BLOG Valid for 10/3 at 7:30 and 10/4 at 2 PM. Please note that this code is not valid for Front Row, VIP or $15 seats. Not valid on Kids price. There is a limit of 6 tickets. No double discounts. Restrictions and charges may apply. This offer expires on October 1st at 11:59 PM – so hurry and don’t miss out! Go HERE to purchase tickets. Take my word for it – If attending the show, be sure to pack some ear plugs or noise cancelling headphones to protect everyone’s ears! This show does get quite loud! 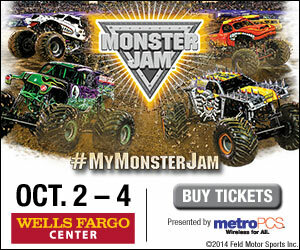 So, who wants to check out this year’s Monster Jam performance? One very lucky Delco Deal Deal reader is going to win a voucher redeemable at the box office for a four pack of tickets to their choice of the October 2nd 7:30 PM or Oct 3rd 7:30 PM show ! Simply enter via the easy Rafflecopter below! Winner will be selected on 9/23/15 Good luck! Thank you for the opportunity! I would love to take my kids and celebrate my son’s October birthday at the show! WOOL can’t wait to go again! Would love to win so I can take my husband, my brother and nephew to the show…. My 3 year old LOVES Graverdigger, Monster Mutt and Avenger! He would be over the moon for this experience, and to share it with his dad and grandfathers! Would be an amazing “big brother” gift for him! We love Max-D!! I would take my son and nephews. Thank you for the opportunity, my favorite monster truck is Grave digger! !! Who’s isn’t! !!! If I was to win I would take my husband, brother in law. And our nephew. He is autistic and this is his first year in school. He has been waiting all year and can not wait to share this with his class…. fingers crossed ! Hopin g to go with my hub! meant hoping to go with my hubby!!! I would take my son, Dylan, & our favorite Monster Truck is Gravedigger! Thanks so much for the chance to win! My kiddies would love this!! hope grave digger is there…perfect for halloween season! We love the gravedigger. My boys and daughter would love this! ABSOLUTELY LOVE THE TIME YOU TAKE TO INFORM OF US OF ALL THE FUN THINGS GOING ON!! THANK YOU FOR THE OPPORTUNITY TO TAKE THE FAMILY TO THE MONSTER JAM SHOW!! JUSTIN WOULD LOVE IT! WE REALLY HAVENT HAD FAMILY TIME! THIS WOULD BE PERFECT! ???‍?‍?‍?? Hi! I think Dragontail was the name of our fav truck. We’d take our two sons, ages 7 & 9. Thank you!! I learned that raffle copter is not mobile friendly, lol. All joking aside, my son would really like to go to this. He has ASD and is obsessed with cars and trucks.